But the higher number, based on the findings of George Washington University researchers in a study commissioned by the US Commonwealth government, is just an approximation, not a specific list of names, according to Governor Ricardo Rossello. "This number may change," Rossello said. "It could be less, it could be more if time goes by." In chaos after the storm said the island's director of public safety, Héctor M. Pesquera, at least six people were killed . 3 people were affected had died in the storm . This number was based on reports from mayors on the island, but the law enforcement agencies had not confirmed the amount, the government said. Nearly two weeks after Maria, President Donald Trump landed for the first time, playing down the devastation. "Every death is a horror," Trump said in early October, before comparing Puerto Rico's official death of 16 to "a true catastrophe like Katrina" in which more than 1,800 people lived died after the 2005 storm that devastated New Orleans. After Trump left, the governor announced that the death toll had risen to 34. One of the conclusions of the George Washington University study were these officials. He did not respond to public criticism and concerns about political motivations that rose sharply as the official record increased to 34 shortly after Trump's visit. 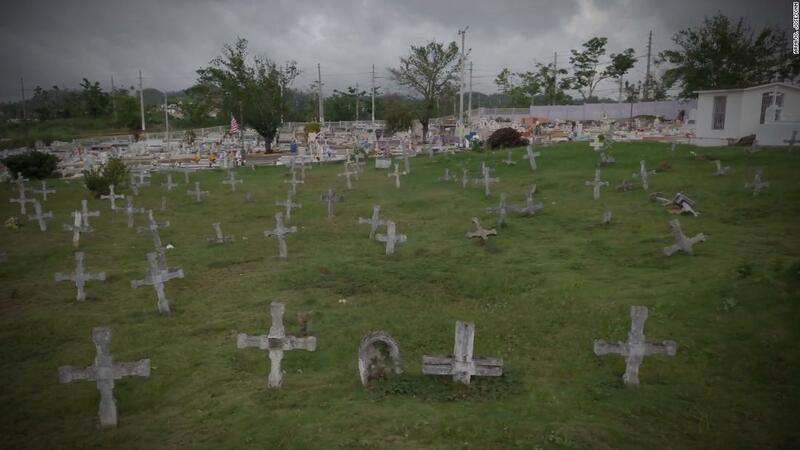 In November, CNN reporters interviewed 112 funeral homes across the island, accounting for about half of all deaths. They found that funeral directors considered 499 deaths as hurricane-related deaths. In December, public security officials revised the official count to 64, and added some deaths recently related to indirect deaths the storm were confirmed. For example, the rescue personnel were unable to reach the house of a man who had collapsed during the storm. Doctors had classified his death as natural, and it was not initially considered a storm-related death. Other deaths later caused indirectly by the storm included a case of carbon monoxide, a suicide, a person being run over by his own vehicle, and a death from complications following a fall. Also in December, the New York Times estimated 1,052 "surplus deaths" after Maria. Other media provided similar estimates. In May, a team involving researchers from Harvard University published a study in the New England Journal of Medicine from 793 to 8,498 people dying in Maria's wake, a range that was criticized by some scientists as too broad. A research letter published this month in the medical journal JAMA estimated that between 1,006 and 1,272 people died in connection with the storm. Puerto Rican government admits to 1427 more deaths than "normal"
. The Puerto Rican government on August 8th quietly stated that the official fee was higher than its December tally. In a report to Congress, the government said documents show that 1,427 more deaths occurred in the four months following the storm as "normal," compared to deaths in the previous four years. The number of 1427 also appeared in a draft report – "Transformation and Innovation in the Aftermath of Desolation" – which was published and opened for public comment on July 9. The Rico government, according to the final report, said on 13th June one day, officials said, […] forced by a judge to publish the death records that CNN and Centro de Periodismo Investigativo must announce in Puerto Rico. Time was running short of updating the official death toll.